In this issue of Spheres, we focus on some specific aspects of current climate change research being done by scientists within the Earth Systems Research Center. The sampling is by no means exhaustive or all-inclusive. Rather, it uses the common thread of the National Science Foundation/NH Experimental Program to Stimulate Competitive Research (EPSCoR) program's "Ecosystems and Society" project to tie them loosely together. 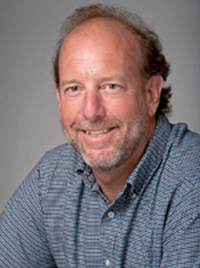 That project, being conducted in collaboration with colleagues across campus and around the state, well represents the trend of linking empirical science to relevant societal needs—a trend increasingly emphasized by national funding agencies and one that EOS researchers have been, and continue to be, deeply invested in. 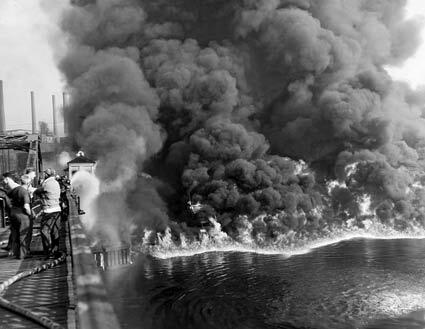 WHEN NORTHERN OHIO's Cuyahoga River caught fire back in 1952, the depth of American environmental degradation was made manifest. The startling image helped spawn the environmental movement and the eventual passage of laws that cleaned up the nation's water and air. In like fashion, if the ever-thickening blanket of planet-warming carbon dioxide were to blacken the sky, would mankind move with similar resolve to apply the brakes on global warming? Cuyahoga River fire November 3, 1952. Courtesy of Cleveland Press Collection at Cleveland State University Library. "There is a critical need in the whole range of climate change science to make the invisible visible," asserts Cameron Wake of the Earth System Research Center, "and measuring carbon dioxide in the atmosphere is a great example." If people could see the parts per million of the greenhouse gas in the atmosphere, Wake says, "I think there would be a different response to global warming and climate change. But the measurements that are part and parcel of science can be very difficult to comprehend because they often remain abstract." And yet, climate change is increasingly becoming less abstract and more visible as extreme weather events change people's lives and society rapidly shifts from a posture of, at best, contemplating the impacts of global warming to adapting to its harsh realities. Close to home, Wake notes that work being done by EOS researchers and colleagues across campus and at collaborating institutions around the region is aimed squarely at helping society see the bigger picture of climate change by shifting the focus from simply safeguarding ourselves from increased coastal flooding and more extreme weather events to protecting the very ecosystems we are embedded in, and which support our lives in myriad ways. 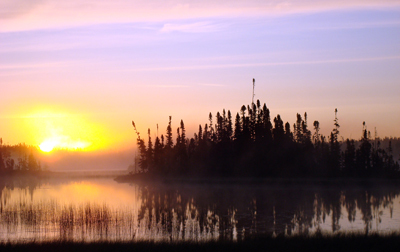 "I see a real transition to the need to protect our ecosystems and preserve our quality of life, which comes through a range of services provided to us by healthy ecosystems," Wake says. 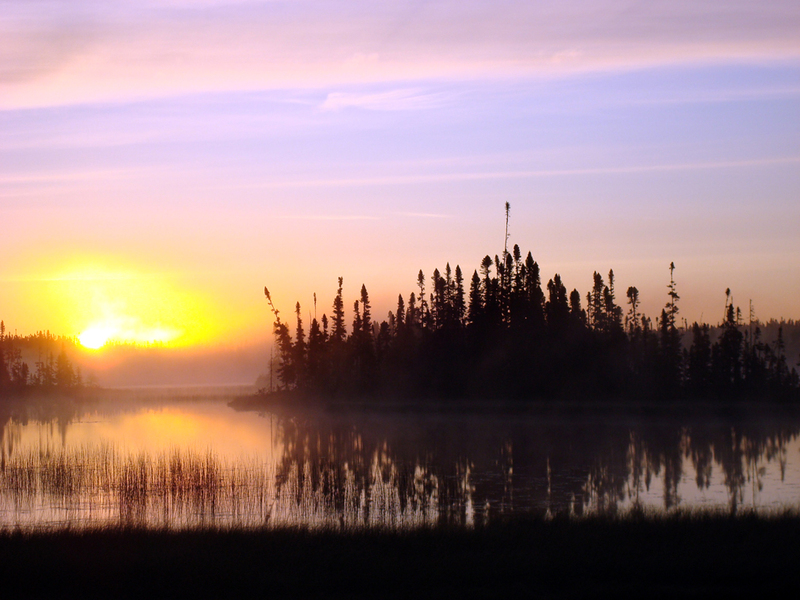 "That's the big frame, and so much of what is being done in the EPSCoR Ecosystems and Society project is about making these largely invisible ecosystem services more visible." The project is multifaceted with a diverse set of goals but, in a nutshell, the big scientific targets are: to better understand and value the current state of ecosystem services such as clean water supply, wood for fiber, fuel, timber, climate regulation (via carbon storage and changes in albedo), and opportunities for recreation; and, develop a suite of models and scenarios that will, in essence, help make the invisible visible and project future changes in ecosystem services resulting from change in climate and land use (see "A Matter of Scale" in this issue of Spheres for specifics on ecosystem services). The hoped-for outcome of all this is a set of informational tools that state decision makers can use to chart a sustainable future from tomorrow to 100 years from now. In addition, the project is by nature interdisciplinary. Says Wake, "It's groundbreaking to have a group of scientists getting together and saying 'We want to help policymakers make better decisions'—that's an explicit goal of this research project." That goal is not only groundbreaking but also well grounded, as gauged by the extensive engagement work Wake and others involved in the project do by collaborating with external partners on projects that are mutually beneficial and aimed at solving a real problem. Says Wake, "I've worked with a lot of external partners, doing climate assessments for example, and they know that understanding the context for future climate conditions is crucial for effective decision making today." The interdisciplinary nature of the project is mandated by its focus on a place that has disparate and interconnected challenges and issues. Those can only be addressed by understanding the entire system, which includes the physical and social sciences. Developing a suite of scenarios that project into the future is a critical component of the work. These scenarios will provide plausible "storylines" on how land cover and climate might change across N.H. over the course of 90 years. of developed land quadrupled from 1962 to 2005. It's tricky work and will require two distinctly separate paths to achieve. The climate storylines will be derived using global climate models in a fashion similar to how the Intergovernmental Panel on Climate Change (IPCC) projects different scenarios of atmospheric levels of carbon dioxide. In this case, however, the scenarios will be scaled down to the state level with the aid of doctoral student Liz Burakowski's dynamic regional climate modeling (see "Mirror Mirror" in this issue of Spheres). 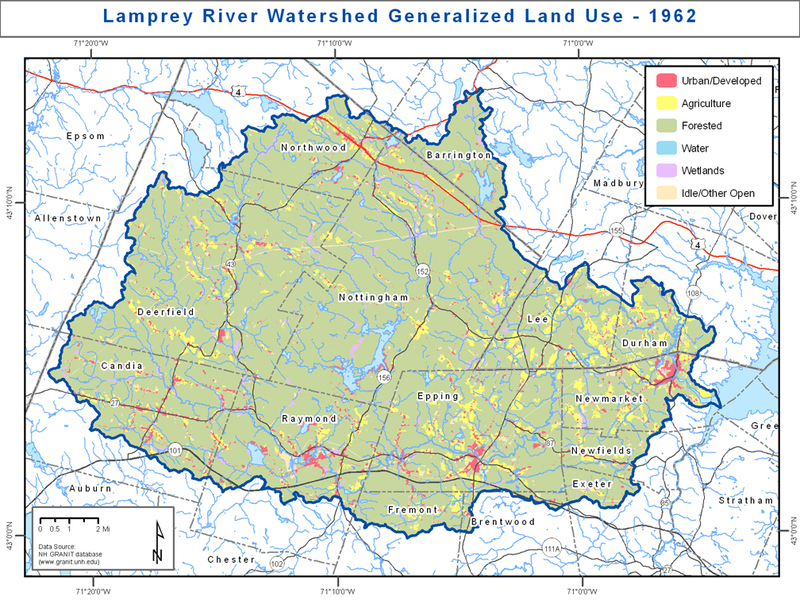 "The land cover side of the equation is really challenging because it's so closely tied to a whole range of potential decisions that people make," says Wake. Because projecting future land use across the state is more like reading tea leaves than empirical science, this part of the socioeconomic scenario work will be an educated guess at best. But it won't be boundless—it will be opinion "bracketed with context." A range of opinions will be compiled by interviewing dozens of different stakeholders across the state who will be asked—from a variety of angles including economic, demographic, regulatory, etc.— what they envision for land use in the future. This data collection effort has been framed and informed by collaborating with Curt Grimm and Barbara Wauchope of the UNH Carsey Institute, which is involved in other aspects of the Ecosystems and Society project. Grimm and Wauchope note that the scenario development process is an extension of the Carsey Institute's research on sustainable communities, and the information gathered through interviews and focus groups "contributes to a richer understanding of socioeconomic development in New Hampshire, as well as providing data for the modeling." Says Wake, "Essentially, we'll take all that input and build a series of narratives that will be plausible storylines, and those narratives, along with the climate scenarios, will drive the models." The models will include two, and possibly three, that have been developed at EOS over a period of decades—the Forest Carbon Water Balance Model (PnET), the hydrological FrAMES (Framework for Aquatic Modeling of the Earth System) Water Balance Model, and the DeNitrification-DeComposition (DNDC) ecosystem model. With data in hand, the researchers will attempt to couple the models to more fully resolve the big picture—something Wake notes will be "one of the grand challenges of the project." Using the same climate modeling approach as the IPCC—scaled down to a much finer resolution to produce much finer land use scenarios—will provide a clearer understanding of not just future changes in precipitation and temperature as climate conditions shift but changes in overall ecosystem services. It's an important distinction; to provide decision makers with meaningful information on how to best chart the state's future, that information must be based on what the impacts to specific ecosystem services are going to be. "So that's an added layer of complexity," Wake notes, "and ultimately comes back to asking, 'How do we make our communities more resilient?' A big part of that resilience comes from ecosystems and the services they provide. And, for me, that's the connection between short-term efforts around adaptation and longer-term efforts at quantifying and communicating those ecosystem services to communities and decision makers." Will Granite Staters, adapting to a changing climate, envision a future of one- or two-acre lots dotted across state with houses wired with high-speed Internet and people working mostly from home? Will many more thousands of acres of farmland be created to increase local food production? Will existing communities be made more dense and the state's agricultural and forestland remain as is? Will we cut down our forests to generate electricity? Says Wake, "Down the road what we get from the scientific analysis of the scenarios will be very useful for communities when they think about how they want to grow and what they want to conserve." He adds, "I'd like to envision a future where our unique set of scientific capabilities leads to improved quality of life for New Hampshire citizens, where scientific analysis is married to the needs of decision makers in order to form a better union."